Check out the cover of yesterday’s USA Today. Does that make you mad? If you are a Star Wars fan, it probably makes you cringe at the very least. When you see something like this, your first thought might be that this is simply a Star Wars / Star Trek mixup from some editor that is not a fan of either franchise. Nah. This is intentional. 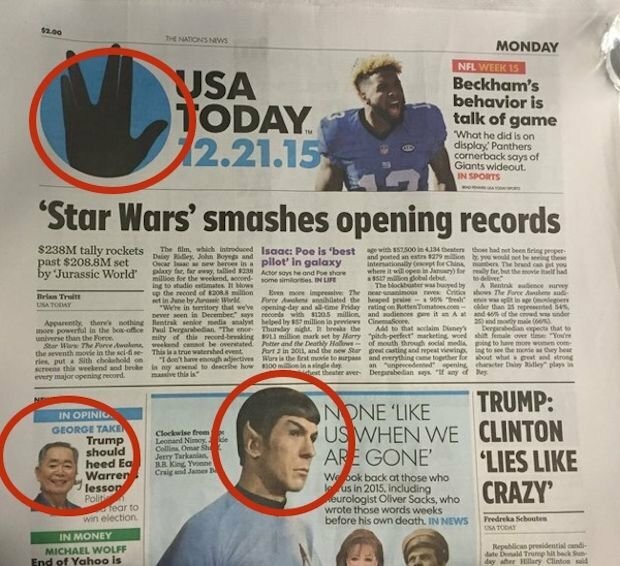 After all, USA Today did something similar on Back to the Future Day. They really had fun with the whole page. While the main headline read “‘Star Wars’ smashes opening records” It just so happens that most of the images on the page are Star Trek related instead of Star Wars. Like the Vulcan salute, and real articles about George Takei and Leonard Nimoy. I wonder how many phone calls and emails they got from angry geeks.